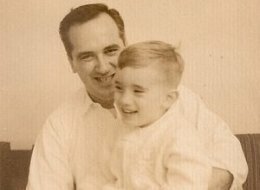 Theodore Olbermann, father of Keith Olbermann, died earlier today at age 81. Keith had discussed his father’s prolonged illness in a Special Comment on health care entitled An American Cry For Help in late February. Both video and a full transcript are posted here. My father died, in the city of his birth, New York, at 3:50 EST this afternoon. Though the financial constraints of his youth made college infeasible, he accomplished the near-impossible, becoming an architect licensed in 40 states. Much of his work was commercial, for a series of shoe store chains and department stores. There was a time in the 1970’s when nearly all of the Baskin-Robbins outlets in the country had been built to his design, and under his direction. Through much of my youth and my early adult life, it was almost impossible to be anywhere in this country and not be a short drive to one of “his” stores. My Dad was predeceased last year by my mother, Marie, his wife of nearly 60 years. He died peacefully after a long fight against the complications that ensued after successful colon surgery last September at the New York Presbyterian-Weill Cornell Medical Center. My sister Jenna and I were at his side, and I was reading him his favorite James Thurber short stories, as he left us. I can’t say enough about Dr. Jeff Milsom and his team at the hospital, and all of those physicians and nurses and staffers in the Surgical Intensive Care Unit who looked after my Dad all this time, and kept him in their hearts. And I feel the same way about all of you who have expressed your best wishes and prayers to him, and to me, and to our family. My Dad was my biggest booster. A day after I was hired by CNN in the summer of 1981 as a two-week vacation relief sports reporter, I traveled by train to my childhood hometown, and walked from the station towards my folks’ house. I was stopped half a dozen times before I got to my Dad’s office by people congratulating me on my impending television debut. There was, of course, only one way they could have known. My Dad, the press agent. Of course it was he and my Mom who took me to my first Yankees games (even though my father nursed a delightful grudge against the team for trading away his favorite players, Steve Souchock and Snuffy Stirnweiss – in 1948 and 1950). But as my interest in the sport began to take the shape of a dreamt-of career, it was my Dad also sacrificed family vacations so we could buy ever more tickets to Yankee games. When we could afford both games and vacations, four times those vacations were to Spring Training. He was my inspiration, and will always remain so. His bravery these last six months cannot be measured. He is as much my hero now, as he was when I was five years old. Posted in Breaking News, Health Care, News Media. Tags: Health Care, Keith Olbermann. RSS feed for comments on this post.. TrackBack URL. I am so sorry for your loss of your beloved father. I will keep you in my prayers and thoughts these days of your grief and healing. What a great man he was! As are you. I am deeply sorry to hear of your dear father’s passing. Despite all the pain and anguish in your heart during your Dad’s deteriorating health battles, your devotion to his plight and love and compassion to help ease his suffering, you continued to express to all of us what our country needs most, health care reform. You gave us all such informative details and brilliantly and compassionately pleaded to all of us loud and clear to save our lives by sharing your knowledge with all your experiences, and how it relates to health care reform. YOU HAVE BEEN YOUR FATHER”S HERO AS HE WILL ALWAYS BEEN YOURS! I was hoping and praying for him to make it and again must say how very very sorry I am. After constantly making this mistake whenever I would refer to you and your show, I now have learned why…..Ted or I should say Theodore is your Fathers first name and also your middle name. I never knew this until now, I found this to be most interesting. Thank you Keith for all your comments and efforts to help us understand all the issues in our government and enlightening us on what our nation needs most. May God Bless you and your sister always and give you strength. May God bless your beloved parents in heaven. So so sorry Keith “Ted” Olbermann. Keith, thank you for sharing a extremely personal aspect of your life. Your relationship with your father was and continues to be precious and there is an entire generation watching and cheering for you. Your pain is shared by millions who struggle with caring for aging parents and question how to navigate the process. I pray that you will never lose your passion for your father, life and humanity.